You seemed so popular. I thought I should give you a chance. After all, I love kale, celery, cucumbers, ginger, lemon. In fact, I have no doubt enjoyed all the ingredients together in a salad. But, we need to talk. For me, something happens when I blend all your ingredients together ... you taste like dirt. Please don't take this personally. It's not you, it's me. So many people start out their day with you. They really seem to like you. I just don't think we're meant to be right now. Seriously, I've tried to enjoy green smoothies, really I have. I've played with different combinations of vegetables all in the hopes of stumbling upon the perfect flavor to delight my taste buds. Every time I eagerly grab that glass of bright green healthy goodness and take a hopeful gulp, the look of disappointment (if not disgust) inevitably washes across my face. I really want to like it, but I just don't. It just doesn't taste good. And if something doesn't taste good, I have no interest in consuming it, no matter how good it is for me. Now... I might be changing my tune. 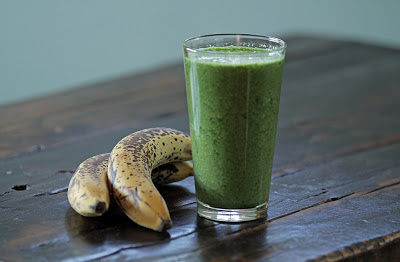 I think I may have found my "gateway" green smoothie - Spinach and Banana. No, it's not as nutrient packed as its more robust relative, but it's a start. It doesn't taste like dirt. In fact, I actually think it tastes good. I highly recommend using a full fat milk in this recipe. I actually used raw milk. The fat is key to the rich and creamy flavor, but if that's not your thing you can surely use a low-fat option. It's up to you. If you don't consume dairy you can use any dairy alternative like almond, soy or coconut milk. It will change the flavor a bit, but it works. Are you a fan or foe of green smoothies? Any combinations that you enjoy most?